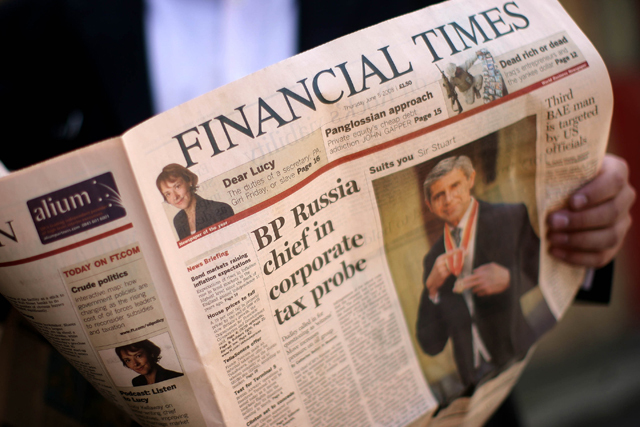 The Financial Times is the pan-European paid-for daily newspaper title most widely read by high-earners across Europe, according to the EMS Survey 2011. Each issue of the London-based business newspaper was read by an average of 910,000 of Europe's richest people across last year, or 1.9% of the continent's wealthiest individuals, the study claimed. Of this readership, 376,700 were in the UK, 5.9% of that country's wealthiest individuals. Anita Hague, the FT's global research director, said: "The latest EMS survey shows that the Financial Times is the newspaper of choice for Europe's highest earners and opinion formers, and is further testament to the growth of our core readership." The UK-based business daily was followed in popularity by the European edition of the Wall Street Journal, which reached 0.7% of Europe’s wealthy – or 317,000 daily readers. Of this 67,000 daily readers were in the UK, 1% of its wealthiest people. Daily Telegraph assistant editor Tracy Corrigan was appointed editor of the Wall Street Journal Europe in December, succeeding Patience Wheatcroft, who left the paper to take a seat in the House of Lords. The International Herald Tribune came in just behind the WSJE and was read each day by 245,000 people across Europe, 0.5% of the continent's richest people, and mostly read in Germany, where it had around 50,000 daily readers. USA Today reached 0.5% with a similar average daily readership of 239,000, with most readers in the UK, around 56,000 each day. The European Media and Marketing Survey, published by the Amsterdam-based Synovate Research Group, measures audience reach among the top 13% earners by income. This group represents the top 20% of households across 20 Western and Central European countries. The study was conducted across 27,028 individuals online and on the telephone in two waves between 13 January and 15 July 2010, then again between 21 July and 24 December that year. The Metro newspaper (the continental Europe version not the UK version) was the free title most widely read by European elites with an average daily readership of 2,872,000 or 6.1% of the wealthiest people. Of the weekly titles, Bloomberg's Business Week reached 0.7% of Europe's wealthiest each week, 352,000 readers. The UK's Economist benefited from a large and healthy readership across Europe as it was read by 1,254,000 people each week on the continent – 2.7% of its wealthy inhabitants. Susan Clark, managing director CEMEA and group marketing director for The Economist, said: "The Economist is read in Europe and around the globe by independently-minded people curious about the world around them. "Their common characteristic is that they are thoughtful, creative, and eager to explore fresh ideas, innovations and opportunities." Time magazine was read by 1,696,000, 3.6% of people, while Newsweek was read by 998,000 each week – 2.1% of Europe's richest people. Forbes magazine was the most widely read fortnightly magazine with 677,000 readers – 1.4% of Europe’s richest. Fortune had 574,000 readers for each issue – 1.2% of Europe’s wealthiest.